May 2012 issue on sale now! | What Hi-Fi? May 2012 issue on sale now! The May 2012 edition of What Hi-Fi? Sound and Vision is on sale today, both in print and online. As ever, it's packed with exclusive reviews, group tests and top tips for upgrading your system. 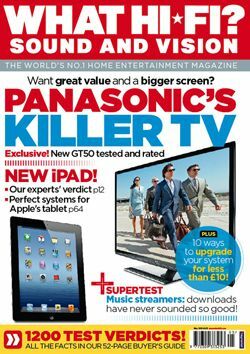 This month we've got our hands on the new Apple iPad, Cyrus 6a amplifier, Cambridge Audio's SLA25 active speakers, Panasonic's DMP-BDT320 Blu-ray player, the Sony Xperia S smartphone, Philips's upmarket Fidelio L1 headphones and Panasonic's TX-P50GT50 plasma TV. For those who want to take their first step into serious, hi-fi quality music streaming, our Supertest pits four state-of-the-art audio streamers against each other. Prices range from £400 to £700, and there are models from Cambridge Audio, Marantz, Pioneer and Pro-ject. We also take a look at premium interactive 46in TVs with 3D and smart technology. The good news is that you can buy one from £1200. And as every home cinema fan knows, there's more to watching your favourite films than just a great picture. Full surround sound is key too, and to that end we've tested a trio of stylish speaker packages that won't clutter up your living room. The replacement for Bowers & Wilkin's Award-wining Mini Theatre range, the MT-60D, makes its debut and goes head-to-head with the Dali Fazon 3 5.1 and Monitor Audio Apex 5.1. Want to boost your bass? We can help there too, with half a dozen subwoofers tried and tested, from just £350 – including the brand-new B&W PV1D, replacement for the legendary PV1. Naturally, we appreciate not everyone can afford to upgrade right now, so we've highlighted Ten Ways to Upgrade Your System for less than £10. From Blu-Tack to secure your speakers, Brasso to polish your plugs and sand to fill your speaker stands, these are simple, affordable ways to boost your hi-fi or AV set-up. And finally, don't forget you can win one of four sets of Tannoy V4 speakers worth £1150 in this month's competition giveaway. The May 2012 issue of What Hi-Fi? Sound and Vision is on sale now in all good newsagents, or you can download the digital edition from Zinio or Apple Newsstand.